The heavy-equipment maker simply couldn't catch a break this year. Find out why. Cyclical companies like Caterpillar (NYSE:CAT) are used to having to deal with downturns in the business cycle. Yet it's rare that so many economic factors have lined up against it, with Caterpillar facing pressure not just in the mining equipment space it shares with peer Joy Global (NYSE:JOY) but also in construction, infrastructure, energy services, and the other industries that it serves. Coming into 2015, investors had hoped that Caterpillar would rebound from a tough second half of 2014 in which the stock lost 15% of its value. So far, the equipment maker hasn't been able to deliver on those hopes. Let's take a closer look at Caterpillar and whether its struggles are likely to continue into next year. 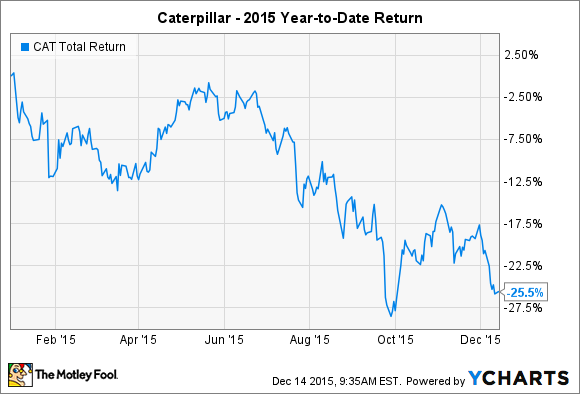 What has happened to Caterpillar in 2015? Caterpillar has seen its fortunes follow roughly the same course as the commodities markets throughout much of 2015, as investors have essentially decided that it isn't likely to see a big rebound in its business until prices on key natural resources bottom out and start to climb. During the early part of the year, Caterpillar struggled with the big drop in crude oil prices during late 2014, adding to the other challenges it already faced. In the quarterly results it reported in January, Caterpillar saw revenue from construction and mining fall 9% to 10%, and that was even before many of the negative impacts of oil's price declines had their full impact. By mid-year, Caterpillar had rebounded somewhat, as investors celebrated signs that the commodities markets might have seen the worst of their declines and might rebound. Some even believed that a dividend increase and favorable guidance would launch Caterpillar toward a full-blown recovery. The second half of the year has brought nearly continuous disappointment. The company cut its sales guidance in both of its quarterly reports, as the negative impact of foreign currency has only exacerbated the fundamental declines in Caterpillar's business. In particular, weak emerging markets in Brazil and China have taken away key sources of growth for Caterpillar, as low prices for coal, iron ore, and copper have combined with the hit to oil and natural gas to create gloomy economic prospects for many resource-rich countries around the world. The low point came in October's third-quarter financial report, where Caterpillar said sales fell 19%, cutting profits by nearly two-thirds. In response, Caterpillar has worked hard to try to restructure itself. In September, the company said it would implement job cuts of 4,000 to 5,000 positions, as well as offering voluntary retirement programs to a host of other workers. Facility consolidation and operational streamlining should produce further cost savings, but Caterpillar investors have to keep in mind that the company has already made substantial moves to reduce expenses in the past. Nevertheless, Caterpillar hopes that doing this now will put the company in a much stronger position when things do get better. One thing that Caterpillar has going for it during this business cycle is that its capital situation is much stronger than it was in the aftermath of the financial crisis. Back in 2009, crude oil had fallen to similar levels, but Caterpillar's balance sheet wasn't as strong as it is now. In addition, Caterpillar's diversification has given it options to pursue that rivals like Joy Global can't. For Joy Global, an emphasis on coal mining has been disastrous because of the monumental price declines in that industry, and Joy won't be able to bounce back as quickly as Caterpillar unless economic strength happens to center on the areas in which Joy has focused. Eventually, pent-up demand will have to be satisfied, and Caterpillar thinks that it can survive long enough to take full advantage of the next equipment-replacement cycle when it starts up. Caterpillar investors can't count on the commodities market to cooperate in helping to boost the equipment-maker's prospects, as commodity-exposed customers are likely to remain reluctant to make purchases as long as they can. The big question is when the global economy will start moving in the right direction again, but until that happens, it could be difficult for Caterpillar to generate much upward momentum.